Cleveland-Lloyd Dinosaur Quarry fossils, Cleveland, Utah, USA. More than 12,000 Jurassic-era dinosaur bone fossils have been found at this site, which is part of a geological formation called the San Rafael Swell. The first major excavations at this site took place in the 1920s. It was designated a US National Natural Landmark in 1965. 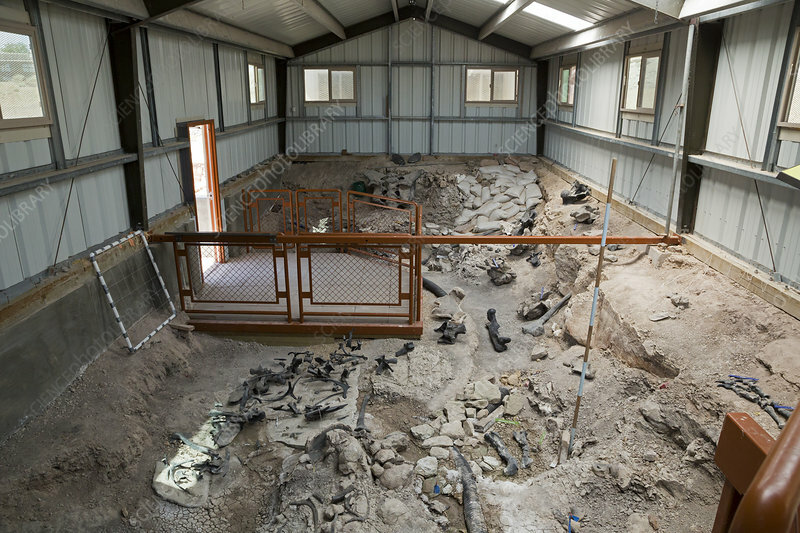 This view is of one of the two working areas around which buildings have been erected to protect the excavations. Dinosaur fossils found here include the carnivorous Allosaurus, trapped in a sticky mud deposit, a form of predator trap. Photographed in July 2015.